When incorporating a product such as AHA Active Gel into your home care program, the overall effect is one of increased smoothness. There is also an evening out of the skin tone, with regular use. The most outstanding feature of AHA’s (alpha hydroxy acids), is the ability to increase exfoliation, revealing a more luminous complexion. HOW SHOULD A.H.A HOME CARE PRODUCTS BE USED? Products containing alpha hydroxy acids should always be used at night. This is due to the fact that these fruit acids may cause photosensitisation. Therefore, it is essential to use a sunscreen daily whilst using the A.H.A product. 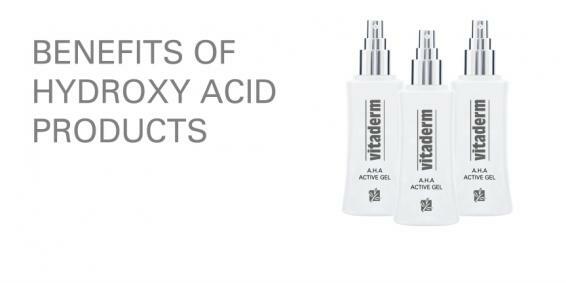 Vitaderm’s AHA Active Gel is an oil-free serum that is suitable for all skin types, including acne-prone. It should be applied to cleansed and toned skin. Ideally, this product should be left on the skin for about an hour, before applying the usual night cream and complex. IS IT NECESSARY TO WEAR A SUNSCREEN DAILY WHEN USING AHA PRODUCTS? It is vitally important to apply a sunscreen daily, and for a week after concluding the use of the AHA home-care product. This will prevent photosensitivity. HOW WILL MY ACNE-PRONE SKIN BENEFIT? – Restoring the acid mantle (natural protective layer) of the skin is beneficial to provide natural protection against microbial invasion. Microbes thrive when the natural pH of the skin becomes more alkaline. This happens during puberty when the sebum content undergoes changes due to hormonal fluctuation. – Acne-prone skin is often prone to flakiness. The alpha hydroxy acids in the AHA Active Gel work over time to reveal smoother, more hydrated skin. HOW WILL MY MATURE SKIN BENEFIT? Mature skin will benefit enormously, especially if you are a smoker. – The skin will become smoother, with dehydration lines becoming less prominent. – Research shows that cell turn-around time is returned to approximately 28 days – the norm for a young individual. Please consult your skin care therapist for more information on how to incorporate the AHA Active Gel into your skin care routine. It is available during April at a special price.